Spartanburg was first established in the 1780s as a courthouse village. It was incorporated as a city in 1831. The city’s primary downtown hub, Morgan Square, is the original courthouse village. Spartanburg played a big part in the Revolutionary War. It was the backdrop for many battle engagements that changed the course of the war and the history of America. Once the war ended, settlements began to form in the area. Following the construction of a new courthouse, the town was named Spartanburg, named for the Spartan regiment of the South Carolina militia. Spartanburg was also known as the “the Hub City” because of the transportation routes connecting Spartanburg to other cities throughout the region. It also got the reputation of the “Lowell of the South” because of the cotton mills that have abounded Spartanburg in the early 1800s. Spartanburg is situated in the foothills of the Blue Ridge Mountains and can be easily accessed by two major airports (GSP and CLT) and two major interstates (I-26 and I-85), it is easily accessible to and from other metropolitan areas: 98 miles northwest of Columbia, 80 miles west of Charlotte, North Carolina, and about 190 miles northeast of Atlanta, Georgia. Spartanburg, SC is part of “The Upstate,” and is the largest city and the county seat of Spartanburg County. Spartanburg, SC is made up of 19.2 sq. miles of land and 0.1 sq. miles of water. Spartanburg SC offers a diverse mix of employment opportunities in the health care, education, and finance sectors, and many others. Spartanburg Regional Healthcare System, one of the most dynamic healthcare systems in the region, is the top employer with more than 5,000 employees. 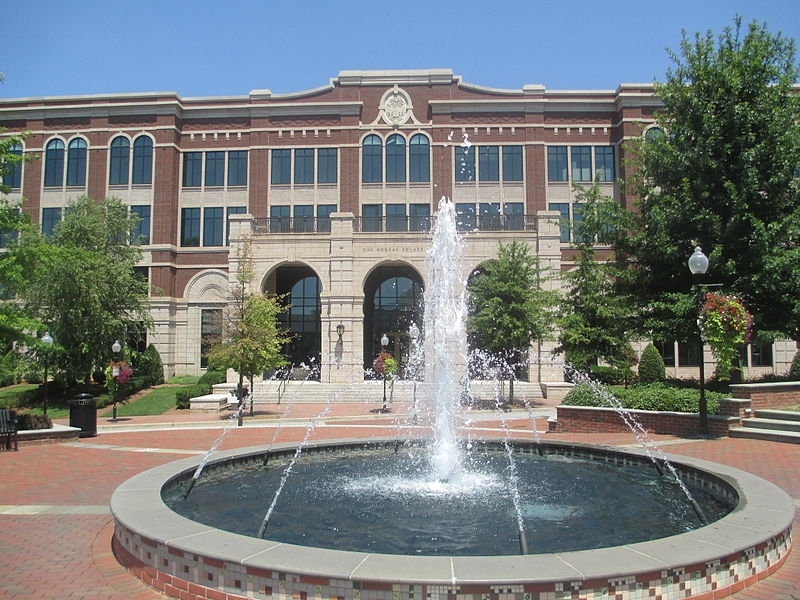 Downtown Spartanburg has also become a magnet for corporate headquarters including Milliken & Company, Denny’s restaurants, Advance America, and the headquarters of QS/1 Data Systems. Numerous other smaller businesses such as RJ Rockers Brewing Company have also moved to Spartanburg. It is the perfect place for starting or continuing a career in some of the nation’s fastest growing fields. Residing in Spartanburg, SC real estate, families, and friends are never without fulfilling things to do. Beginning with the historic downtown, there are unique shops, restaurants, offices, museums, concerts, and events that everyone can enjoy. In Spartanburg, you can you walk in the footsteps of legendary musicians on the Hub City Music Trail and then catch a concert at the David Reid Theatre or the Showroom. Other main attractions include The Hub City Farmers’ Market, an outdoor market held Saturday mornings from 6:00am – 12:00pm during the summer and fall on the grounds of the historic Magnolia Street Train Station; The Annual Sidewalk Arts Show; Red, White and Boom celebrated every 4th of July; Music on Main, a street concert event held every Thursday (April through August) in downtown Spartanburg; Spring Fling, a weekend festival held the first Saturday of May; and many other events that entice residents of homes in Greater Spartanburg area. Spartanburg SC homes are laden with neighborhood parks, such as Barnet Park , Cleveland Park ,and Croft State Park. Croft State Park is great for outdoor adventures of hiking, biking, camping, fishing, and boating. Spartanburg, SC real estate offers abundance in housing options. It features a great mix of housing styles to appeal to all types of families, investors, and first-time homebuyers. The beautiful city of Spartanburg offers a variety of home styles, ranging from historic homes and master-planned communities to single family and custom homes. With a reasonable cost of living, excellent schools, and low taxes, Spartanburg SC real estate is increasingly popular for transplants from other cities who are seeking affordable housing. The average price tag of homes for sale in Spartanburg SC is in the mid $150s and homes range from the low $100s into the millions. Spartanburg, SC is home to some of the most highly rated public schools in the state. Spartanburg High Schools is a four-time National Blue Ribbon School, one of the most rigorous high schools in the nation; Pine Street Elementary Schools is also a national model school. Click here to find out all schools in the Spartanburg SC and check out the different school districts.